By William Teach of Pirate’s Cove. Follow me on Twitter @WilliamTeach. The UK Guardian has recently spent quite a bit of time exposing the ever growing power of government interference in the lives of people via the National Security Agency and their ever-present spying. Now they have a big article on the upcoming UN IPCC AR5 “climate change” report, and let the cat out of the bag as to the purpose, in between the typical Alarmism Of Doom. Scientists will this week issue their starkest warning yet about the mounting dangers of global warming. In a report to be handed to political leaders in Stockholm on Monday, they will say that the burning of fossil fuels and deforestation have now led to a warming of the entire globe, including land surfaces, oceans and the atmosphere. Extreme weather events, including heatwaves and storms, have increased in many regions while ice sheets are dwindling at an alarming rate. In addition, sea levels are rising while the oceans are being acidified – a development that could see the planet’s coral reefs disappearing before the end of the century. 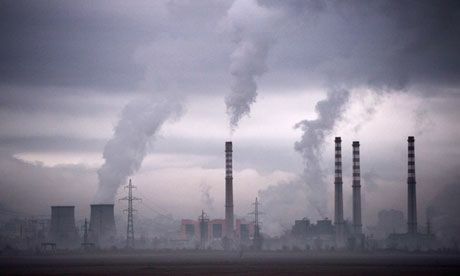 Writing in the Observer ahead of the report’s release, the economist and climate change expert Lord Stern calls on governments to end their dithering about fossil fuels and start working to create a global low-carbon economy to curtail global warming. Governments, he states, must decide what “kind of world we want to present to our children and grandchildren”. And there you have it, the whole point. How many times have I and other climate realist bloggers written about this whole movement being a Fascistic/Statist (ie, Progressive) power grab, putting government in control of people, private entities, and economies? Science plays little to no part. If it did, Warmists might practice what they preach, but do you see them giving up their own fossil fueled lifestyles? This year’s COP19 is in Warsaw, Poland. How many fossil fueled flights and vehicle trips will be taken (granted, much better than in ends of the earth Durban, South Africa). Then there are all the meetings in between. Perhaps if Warmists, especially the “leaders”, would walk the talk, they might be credible. But they don’t even seem to believe their own yammering.